So Jim Tressel is now out at Ohio State. Here is a coda to that story: Urban Meyer may be his successor. Urban Meyer has been bandied about as a potential replacement for Tressel since long before this day–ever since Tressel was first implicated in the tattoo parlor thing and Gordon Gee went all Henny Youngman on us (Kids: Wikipedia) by treating us to a shameless assortment of one-liners on how he hoped the coach would not dismiss him. 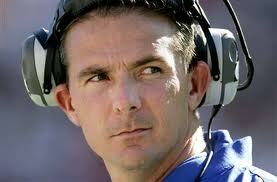 Would Urban Meyer take this job? Don’t rule it out. Despite the presently tattered state of the program, Ohio State remains one of the top five coaching jobs in all of college football. What’s not to like about that? Conventional wisdom holds that Urban Meyer, as any other decent head coach, would want to avoid Ohio State like the plague because of the NCAA probation which is all but certain now for Ohio State. Yet Urban Meyer might be attracted by the challenge of rebuilding a tattered program at Ohio State. He might also be attracted by the prospect of lower expectation levels during the early years. Michigan fans: If this happens, then if you get the urge to bum rush the field after scoring a touchdown against Ohio State, then I would strongly advise you to reconsider. Take it as wise advice from someone who’s been there before: That sort of thing does NOT go over very well with the Urbanator.